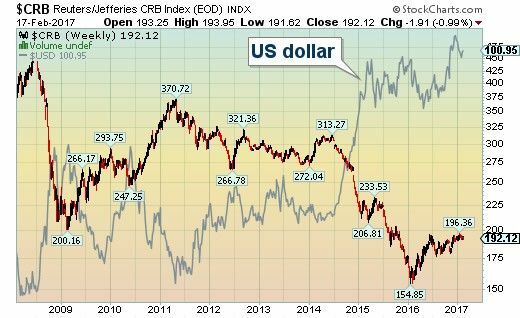 Recent pro-US rhetoric from the current administration is only adding to an existing multi-year renewed strength of the US dollar. The chant of "USA first" has only been the last of the drivers to push the greenback higher. Some of the other factors have been unemployment, which has reached a milestone at 4.8 percent, the second lowest level since 2006. Consumer confidence has scored a new level recently with a 13-year high. Business confidence (ISM Purchasing Managers Index) has turned-up over the last year, though not reaching a new high as in the Consumer confidence gauge. Adding to the positive economics, the FOMC has seen fit to rise the interest rate up twice over the past two years. All of this factors have played well into the dollar bulls. 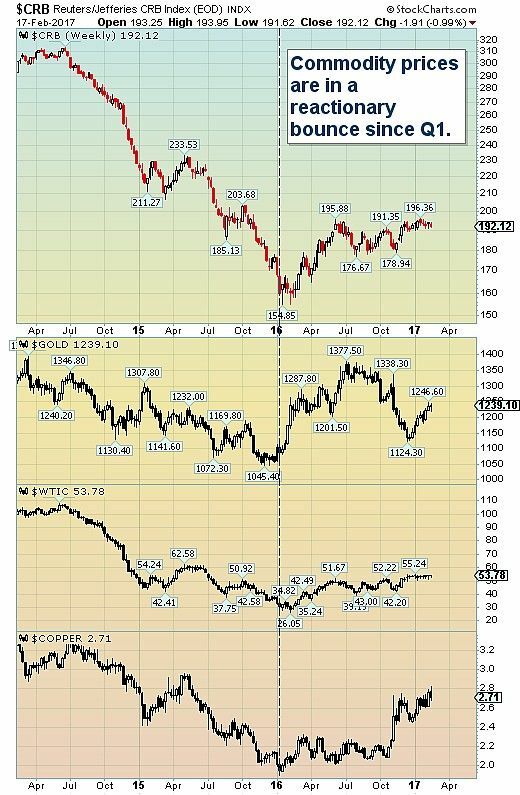 The US$ has advanced almost 10 percent since mid-2016. 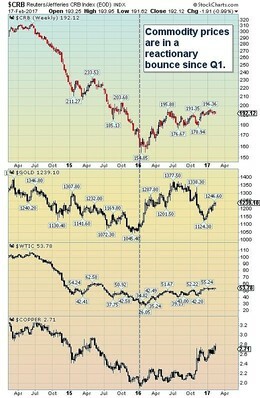 And on the losing end of the equation has been commodity prices. Natural resource prices tend to trade in the opposite direction to the Big dollar. Bottom line: The trend, for the US dollar, going into 2017 only looks higher. With the US economy continuing to improve, a president focusing on infrastructure spending and job creation plus one or two expected rate increases coming in the next 10 to 12 months, the dollar should continue its rise and reach $1.04 by mid-year. Commodity prices, though currently enjoying a reactionary bounce since Q1, are not expected to hold this rebound. Dollar pressure should slowly erode this bounce in the months to come.